It seems logical that drinking a juiced apple should be nutritionally the same as eating a whole apple – but is that the case? Not necessarily. Whole, fresh fruits almost always offer greater nutrition and higher natural vitamin and mineral counts than fruit juices, especially if the juices have undergone extensive processing. Specific calorie counts and nutrient information vary, depending upon which fruit you choose and how its juice is processed. A mixed fruit-juice drink that contains more than 3 percent juice has about 110 calories, 0.3 grams of protein, 0.25 grams of fat, 27 grams of carbohydrates and 0.2 grams of fiber per 8-ounce glass, according to the U.S. Department of Agriculture. In contrast, a cup of fresh fruit salad has about 75 calories, 1.2 grams of protein, no fat, 18 grams of carbs and 4 grams of fiber. 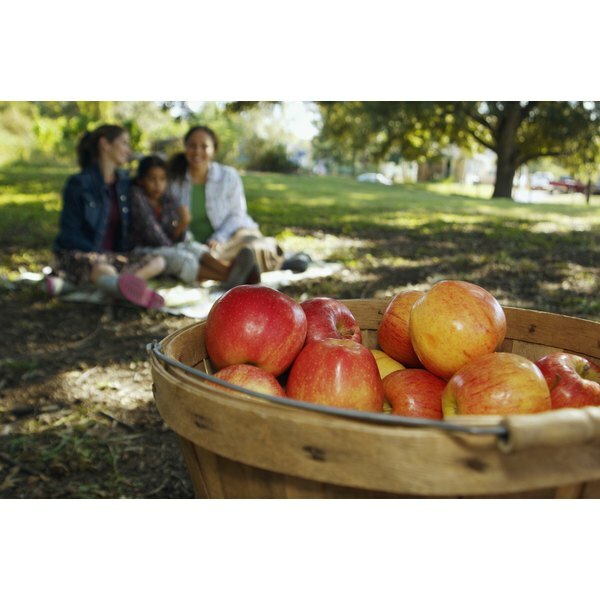 One 8-ounce glass of unsweetened apple juice has about 115 calories and 0.5 grams of fiber. One cup of sliced apples, however, has 57 calories and 2.6 grams of fiber. One of the most significant nutritional differences between whole fruit and fruit juice is fiber amount. Eating the recommended amounts of fiber can improve blood sugar control, encourage weight maintenance or weight loss, lower cholesterol and blood pressure, ease inflammation, lessen cardiovascular risk factors and boost digestive health, according to CNN.com physician-nutrition specialist Dr. Melina Jampolis. In the thinning and juicing processes, most fruits lose a lot of their fiber, which tends to concentrate in their peels. For that reason, eating whole fruit instead of drinking juice can make a crucial difference in improving overall health. A study published in 2013 in the “British Medical Journal” from researchers at the Harvard School of Public Health, discovered that people who ate more whole fruits enjoyed a lessened risk of diabetes and people who drank more fruit juice had a higher risk of the disease. One possible explanation is that fruit juice has a higher glycemic index and lower fiber count than whole fruits, so it passes through the digestive system more quickly – especially if it is juiced with lots of refined sugar. Whole fruit may be a smart nutritional choice, but it’s most beneficial if you eat it as part of a balanced diet that contains foods from all main groups. As Dr. Jampolis noted in a 2009 article for CNN, fruits have relatively high sugar counts and about three times the calorie count of most vegetables. As long as you stick to two to three servings per day, however, you’re probably not at risk of gaining weight or raising your diabetes risk by fruit alone. For individualized guidance on how best to fit fruit into a diet plan, speak with your doctor or a registered dietitian. CNN.com: What Exactly Does Fiber Do?